A few months back I did a review of the Echosex 2 from the Italian company Gurus Amps. It sounded heavenly and itâ€™s become a favourite of many Gilmour fans and fans of vintage analog echo. Gurus has expanded the design to get even closer to those old Italian units. Hereâ€™s my review of their brand new Echosex 2 T7E. I love echo and analog delay. One of my very first delay pedals was a EHX Deluxe Memory Man. I used it for years and it set the standard for what Iâ€™m looking for. Warm, lush repeats and a bit of that quirkiness and mojo. It had everything. Gurusâ€™ Echosex came close. So much so that I retired my old Memory Man and itâ€™s now in safe storage. The biggest difference between the Echosex 2 and the new T7E is its features. The overall tone is the same. Itâ€™s not as pristine and clean as youâ€™d expect from a Binson type echo but perhaps somewhere between a Memory Man and Binson. 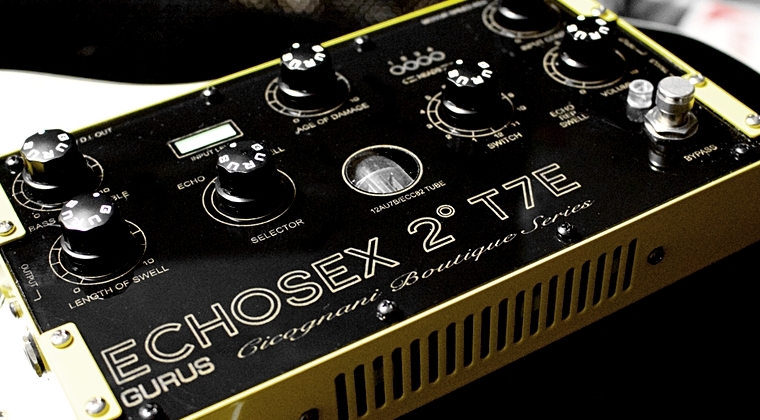 Whereas the Echosex 2 was based on a scaled down single head type of echo, the T7E offer the full package, including a 12AU7B tube, class A preamp, super sweet musical modulation, selector switch for echo, repeat and swell and four buttons for selecting the individual heads, either alone or in combination. I wonâ€™t go into all the details. Youâ€™ll find them on gurusamps.com. The T7E is huge and probably not something youâ€™d want on your pedalboard although it does have the setup for it. It feels natural to treat this like those old echo units and either keep it on a stand or on top of the amp. Itâ€™s obviously also a superb outboard studio unit. Itâ€™s pricy but again, this is not your typical mass-produced echo pedal. This is the modern alternative to a Binson and if youâ€™re considering buying the real deal but donâ€™t want the hassle of maintenance and hunting down parts, the T7E is probably your best choice. It has the look and feel of a Binson and although there are no mechanical moving parts it sure has some of that slightly unpredictable mood. Itâ€™s not a pristine digital delay but rather a faithful recreation of a unit from an era long gone. Tonewise the T7E provides anything from classic slap-back to up to 740ms delay. It has single head repeats, which is your typical echo, and the multiple head combinations allow all sorts of musical textures. The swell mode creates a reverb-like echo similar to what David Gilmour used to create the intro on Time. The input control allow a bit of pre-gain boost which is great for adding a bit of bite to your clean tone, while the Length of Swell control, or the feedback, provides everything from short repeats to wild self-oscillation. My only concern is that Iâ€™d wish there was a bit more definition in the repeats. It can be hard to hear all the details in some of the head combinations and the swell mode. Other than that I really donâ€™t have any complaints. Iâ€™ve had a lot of fun with this thing and itâ€™s definitely one of those pedals you just want to leave on for all of your tones! Great review. Out of curiosity, were you powering the unit at 12v 500mA or at 9V 400mA? I think that may have had an effect on the clarity of the sound. I bought the T7E as I was a big fan of the ES2 LTD. I too wish the repeats were a bit more defined. Itâ€™s a great unit regardless. And a lot of fun. Hey Bjorn, I already have the Echosex 2 Ltd. Should I sell it and get the TZE? Is it worth the extra $? Also have you ever tried any of the SIB Echodrives, Blue or Red and have an opinion on those delays? Just wondering as those have big tubes, high plate voltages, etc. Haven’t tried those so I can’t tell. Hi Bjorn, are the multi-head repetitions not too dark, for the swell effect? For the intro of Time in particular! Is not the swell effect more realistic on the Boonar? The Boonar has more clarity and definition so for time I’d go for the Boonar. For analog sounding single head echo I’d go for the Echosex. many thanks for all your informations and reviews. Your website is the best in the internet especially for Gilmour tones and it helped me very well. Here my question: do you use the reverse connection on the “wha wah” pedal to create the “seagull effect”, as you explain on your Echoes seagull tutorial? ‘My only concern is that Iâ€™d wish there was a bit more definition in the repeats. It can be hard to hear all the details in some of the head combinations and the swell mode.’ That’s because the unit uses the PT2399 digital chip, which was developed for karaoke machines and has limited frequency response, delay times, and resolution (about the same as a bucket brigade chip). Some great delays have been made with it despite it’s limitations (Skreddy, Crazy Tube Circuits,Faux Tape Echo), but as with the various Echosex units the key to the good sound is the analog preamp and filtering circuitry. Units like the Catalinbread and Boonar use a 24bit chip, which as far as the average human ear can tell has the same resolution as an analog electro-magnetic device, which is why they have clearer repeats and can get longer delay times without digital distortion. .
More or less the same features. The Boonar has more definition in the repeats and you can hear the heads better but the Echosex has a smoother and warmer tone I think. They’re both great but overall tonewise I tink the Echosex is my favourite. Thanks again for providing such a valuable resource to our Gilmour community! Well, the Echosex is an analog delay or echo so it’s not meant to produce pristine digital repeats. Echo will always sound darker, with a more uneven or dirty decay. The standard Echosex sounds very similar to the old Deluxe Memory Man. My issue with the T7E is that it can be hard to hear the subtle details when you select more complex head combinations. It’s very clear when you chose only single head repeats.